Browse: Home / SURPRISE! I am launching my next Pro Makeup Course! Hi, my loves, I am Super excited to share this news with you, and I know that this is something many of my followers have been waiting for! Ever since the first 2 batches were SOLD OUT, I’ve been getting msgs from so many of you who couldn’t enroll. So Finally I have decided to give you guys a surprise. 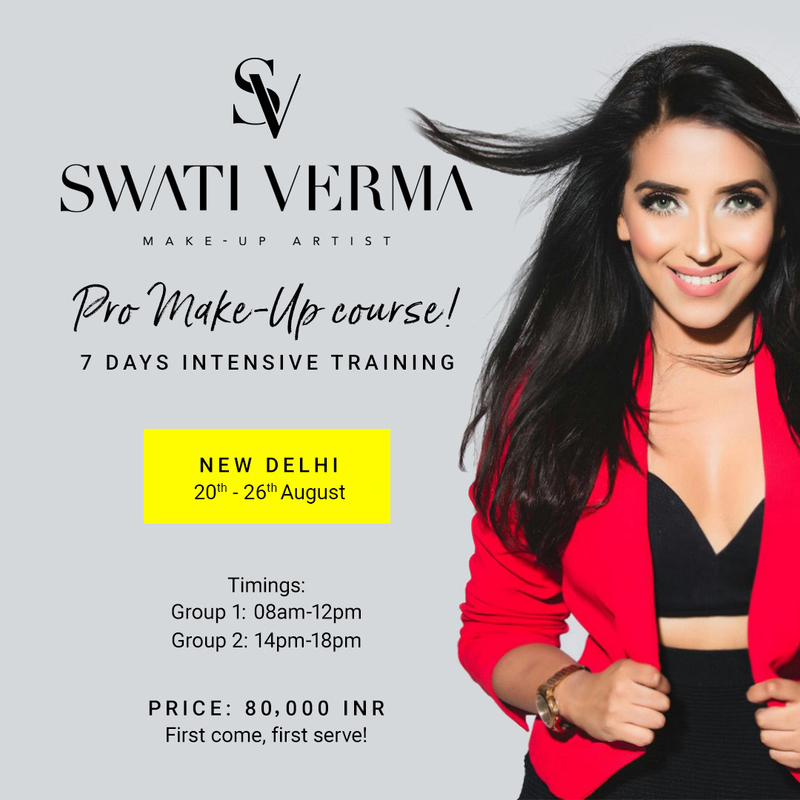 I am talking about my third batch of PRO Make-up course, which will take place from the 20th to the 26th of August at my studio in New Delhi. For your ears only: this course is the beginning of something bigger, as I’ve launched Swati Verma Academy, which is kind of an educational platform with lots more to come in the future. Stay tuned for that. Back to the course though. As you can tell from the dates, it will span over seven days with approximately four hours of classes on each day, depending on how we get on with the curriculum. It is me personally who have designed the course program, which is suitable both for beginners and aspiring artists as well as for professional makeup artists who wish to improve their skills. The group will be divided according to the students’ existing knowledge and experience, and there will be no more than 18-20 students at a time in the class. This is to ensure focused learning and individual coaching for all students. We will start from the basics by going through different skin types, essential hygiene and how to create the perfect base, with among other foundations, concealers, and various blending techniques. From there we move on to diverse kinds and features of eye makeup, airbrushing and some of my signatures look, such as “Glamorous”, “Bridal” and “Day Occasion”. In addition, you will also be given practical and professional advice on how to manage your own makeup business and how to grow in the industry, also in terms of using social media as a marketing tool. Every day, you will have the occasion to practice on your fellow students, or on your own model, and at the end of the course, you will receive a Swati Verma Academy Certificate. This is a valuable document which may help you to kickstart your own career as a makeup artist, let it be freelance or employed. On the final day of the course, you will also be creating one complete look on a model that you have arranged for yourself. Even though I did my best to talk you through what the course is all about, I realize that you probably still have hundreds of questions. Therefore, I have gathered some possible questions below – along with the appropriate answers. You sign up for the course by clicking this link and then following the instructions provided. It is quite straightforward but does not hesitate to get in touch if anything seems unclear. Good luck and I really hope to see you in June! If not, keep an eye open for upcoming events and opportunities in the future. As I said earlier, this is just the start! A: The Swati Verma Academy Makeup Course is for everyone interested in makeup and who wants to learn Swati’s secret hacks, tricks, and magic. Q: Do I need any previous knowledge or experience in doing makeup? A: This course is suitable for beginners as well as for professional makeup artist. We will divide the group into different skill levels and train them accordingly to their experience and knowledge. Q: Will there be any hands-on training? A: Yes, there will be hands-on training every day on your fellow course participants, or on your own model during the last one and a half hours of the class. Q: Will I be practicing on myself? A: No, you practice on your fellow students or you can bring your own model every day for the last one and a half hours of the class. On the final day, you will also be creating a look on a model that you have arranged for yourself. Q: Do I need to bring my own makeup? A: Yes, please bring along your own makeup kit, including brushes and tools. Q: What all do I need to get in my kit for the Pro Makeup Course? A: A mandatory list of makeup products will be provided to the students on ENROLMENT on their respective email ids. Q: Will I get assistance in building my own vanity bag during this course? A: Yes, you will get proper assistance in building a new vanity bag, alternatively in adding some necessary products to the existing one. Q: Will I be trained from Swati herself? A: Yes of course. Swati will be your supervisor and teacher during the whole course. Q: What’s the medium of Language? A: This Course structure is planned in ENGLISH, but questions can be asked & answered back in HINDI on request. Q: Do I get a certificate after the course is completed? A: Yes, all students will receive a signed certificate after the completion of the course. Q: Why is the price for the course shown in INR, while at checkout it is paid in SEK? Interested in joining the first ever Swati Verma Academy Makeup Course? To register, please follow the instructions in the widget below.